We can use different Face or Animoji on FaceTime video call in iOS 12 on iPhone X. Replace your FaceTime feed with an Animoji before or on calling to someone. 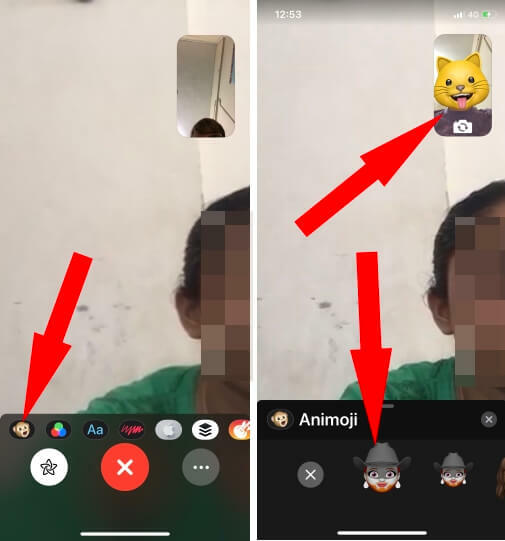 Let’s see how to make the video call with your pre-ready Face Filters in the personal video call or Group FaceTime Video call. People are widely using Animoji Face on Group FaceTime video call (Add up to 32 Persons), so no one can identify the person in whole conversations. In iOS 12, FaceTime introduced new built-in real-time Face changer option as a Filter preference. Here I will show you where is the tool to change? Or set new Animoji on Face while we are on a Video call. Face Swape and Use Face Filters in Third-Party Apps Snapchat, Facebook Messenger, Face Swap Live on Instagram, Skype. That’s most popular and enable on the Video call or Live Video. Memoji incompatible iPhone: iPhone 8, iPhone 8 Plus, iPhone 7, iPhone 7 Plus, iPhone 6/6 Plus, iPhone 6S/6S Plus, iPhone 5S. Sorry, we can’t add new Animoji just like custom Memoji on Messages app in iOS 12. To use Animoji on FaceTime, it doesn’t need Face ID compatible phone (iPhone 8, iPhone 8 Plus, iPhone 7, iPhone 7 Plus, iPhone 6S, iPhone 6/6 Plus, iPhone 5S) or. But Memoji required Face Detection camera compatible iPhones (Ex, iPhone X). 1: Open “FaceTime” on iPhone, iPad. 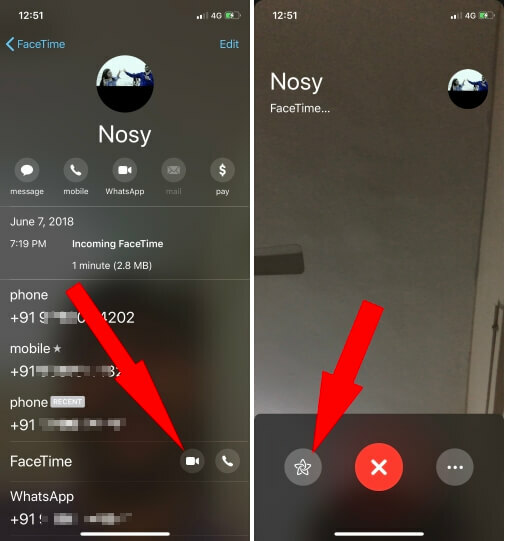 2: See option for “FaceTime Video call” > Tap on “Star icon” near to close FaceTime video call. 3: Find New Filter option, you can see the option for animoji and sticker, Click on “Bear Face” icon to explore more. You can also use or involve sticker from the sticker pack option on your iPhone’s screen. Tap on it, and Select that you want to apply on your face. You can switch or find all Animoji by expanding “Animoji Drawer”. Along with Animoji Face you can use Stickers on video that showing on above screen next to the bear icon. If you are in trouble with FaceTime Video or Audio calling, Check out this tutorial and fix most common FaceTime problems in ioS 12 after update on iPhone X or True Depth camera 2018 iPhone models.